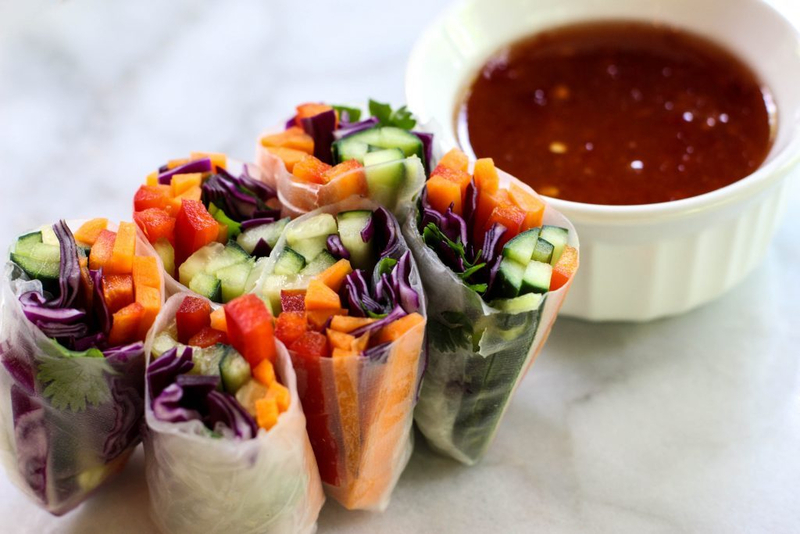 Veggie Spring Rolls | Got Milk? Dip one rice paper in a bowl of warm water for about 10 seconds and drain off the excess water. Place it on a wooden cutting board. Place the filling ingredients in the center of the rice paper, including as much of each as desired, but be careful not to overfill. Fold one edge over the filling, fold in the sides, and roll it up. Repeat until all the ingredients have been used. Whisk all the ingredients together in a small bowl. Add hot water a spoonful at a time, mixing the sauce until it’s creamy. Serve with a cold glass of milk, and enjoy!